Kumbhalgarh is a massive Mewar fortress built in the 15th century, with seven heavily fortified gateways and a perimeter wall that extends a staggering 22 miles (36km); possibly the second longest continuous wall in the world. Inside this intimidating complex there are more than 360 temples (300 ancient Jain and the rest Hindu) in addition to the main palace. The fortress has immense sentimental significance for local inhabitants because it is the birthplace of Mewar's legendary king, Maharana Pratap. Needless to say, one can spend hours exploring this architectural and historical playground, and those who enjoy climbing will find many opportunities. The views from the many vantage points of this fortress are astounding. Legend has it that the maharana who built Kumbhalgarh encountered some construction difficulties and consulted a spiritual advisor who decreed that a voluntary human sacrifice would enable the project. A volunteer was eventually found and the position of the decapitated head and body signalled where building should go forward. A shrine to this unknown volunteer can still be found in the main gate. Kumbhalgarh is situated about 50 miles (82km) to the northwest of Udaipur and the drive will take about one and a half hours, making it a manageable and rewarding excursion. 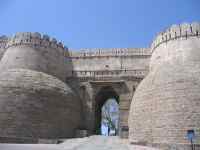 The fort is extremely well-maintained and the fact that it is a little remote ensures that there are seldom crowds, despite how astounding an attraction it is. There is a sound and light show in the evenings but it is conducted in Hindi.